I’m in the process of finishing an overhaul (tear down, clean up, paint, and reassemble) of a Invicta/Delta DJ-15 6” jointer (blog series can be found here). Part of this process involved installing new bearings (NTN 6004LLBC3/EM) in the cutterhead (no new bearings in the motor), a Fenner Drives PowerTwist link belt, and a cast iron motor pulley (Amec AK71X5/8). I should note that I do not own a press, so I used a pipe sized to the outer bearing race diameter to press the bearings into the bearing blocks, and another pipe sized to the inner bearing race diameter to press the bearings onto the cutterhead shaft. Everything seemed to go ok there. Upon completing reassembly, I fired up the machine and noticed two things: 1) it was much louder than I expected, and 2) it vibrated more than expected. I should preface this with the fact that this is my first jointer, so all preconceived notions about noise are solely based on YouTube videos that I’ve seen. I took some video of this first test run to more clearly illustrate what I’m talking about. Afer the initial test run, it was obvious that something, or some things, needed adjustment. Given the belt flutter that I saw in the first go round, I figured that the belt tension was insufficient and that I likely needed to shorten the belt by removing some links. However, I did not want to do this right away without first checking a few other things. So, I removed the belt from the pulleys and decided to run the jointer without the belt just to see if I could pinpoint whether or not it was a motor issue. Specifically, since I did not install new motor bearings (this may come back to bite me, but we’ll see), I wanted to determine whether or not that needed to be done. Running the jointer with the belt removed resulted in significantly less vibration (passed the nickel test) and significantly less noise. You can still hear the high-pitched hum from the first video, but based on what I’ve read, that seems to be associated with the VFD carrier frequency. Although not shown in the video below (I do mention it), I did play around with adjusting the carrier frequency (function “F12”, factory setting “005”, 8kHz). I found that switching the setting to “008” (14.4kHz) all but eliminated the high-pitched noise. I chose to revert back to the factory setting of “005”, as I’ve also read that setting the carrier frequency too high can shorten the lifespan of the motor and/or VFD. See below for a video of the machine running without the belt. I think that running the jointer without the belt demonstrates that it doesn’t appear to be a motor bearing issue (although I am certainly open to other opinions, as I have zero experience with this, as this is my first jointer and first machinery refurbishment). So, given that I installed new cutterhead bearings (and I think I did it properly), I figured I would try removing a few links from the belt in order to shorten it up and create more tension between the pulleys. I did this in an iterative process by removing one link at a time, reinstalling the belt, running the jointer for ~5 minutes, and observing the results. I ended up removing a total of 3 links from the belt, shortening it from a total of 64 links to 61 links. In doing so, the jointer passes the nickel test, but there is still some noticeable vibration (although definitely less than pre-shortening of the belt), I think I still see a little belt flutter, and it’s still louder than expected. I’ve posted a third video below for this final test run. So, with all of this completed, I think there are at least a few additional things I can try. I may try removing an extra link or two from the belt to see if that helps with the still somewhat noticeable flutter that was observed in the final video above. Note that I didn’t bother mentioning belt deflection at the mid-span between the pulleys, as that seems to be very subjective in my opinion. I believe the standard rule of thumb is something like 1/64th of an inch for every inch between pulleys (center to center). 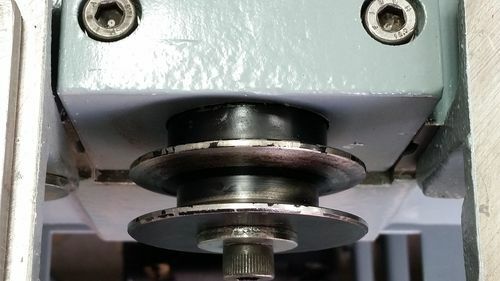 The distance between the pulleys on this jointer is 16.5 inches, which equates to nominally 1/4 inch of deflection at the mid-span of the belt when subjected to finger pressure. I’m not really sure how much finger pressure to apply, but with what I would call moderate finger pressure, the belt deflects on the order of 1/4 inch, maybe a little more. Maybe I’ll give it a go and see what happens when I shorten up the belt once more. I may also try firming up the connection between the jointer and mobile base (PM-2500), maybe add some rubber isolation pads to try and help with noise/vibration. I’ll likely take the same approach with the VFD enclosure, for the same reasons, but also because I can’t imagine that the vibration that I observed in the enclosure is good for the VFD. I also noticed that the link belt seems to ride rather “high” in the pulleys, so perhaps that has something to do with the issue. I still have the old rubber v-belt, so maybe I’ll try putting that on just to see what happens. So, a few questions for those out there with jointer experience (any jointer experience is more than I have)...what do you think? Is the noise level reasonable? Does there seem to be too much vibration? Are there other things that I should check? Are there other tests that I should run? I’m open to any/all suggestions, so fire away. I’m hesitant to try just running a few boards through to see if it produces acceptable results, as I don’t want to cause any damage, particularly if there’s something relatively easy that I can try to fix…but maybe that’s exactly what I need to do. Hopefully I’m able to come to a resolution here shortly. Ok, that’s enough for now, it’s been a long day. Thanks for looking! 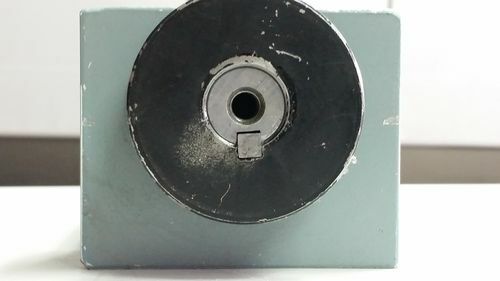 Maybe you are getting noise from the mobile base against the jointer, the mobile base against the concrete floor and not having a cover installed over the motor and belt. Kind of giving you an echo chamber maybe. From your video the nickel never moved. To me a sign of very little vibration. I would run some wood through it. Bet you’ll be pleased. Looks to me like you did a GREAT job! Yeah, after all of the checks that I’ve done thus far (running with and without the belt, running without the belt with the new cast iron pulley and the original pot metal pulley, swapping out the link belt for the original v-belt, pulling the knives/locking bars/jack screws and running to see if something was out of balance there, re-checking and re-re-checking pulley alignment), it definitely seems like a cutterhead bearing issue. Not sure if it’s an installation issue on my end (likely given my inexperience) or just a bad bearing or bearings (much less likely). Probably the most telling is the latest test where I removed the belt and spun the cutterhead as fast as I could by hand…just doesn’t sound right. See below for a video. Looks like it’s time to pull the cutterhead assembly and take apart all of the components. Any suggestions for things to look for or tests to run to try and pinpoint whether it’s one bearing, both bearings, the cutterhead pulley, and/or the bearing blocks? I had a problem with my jointer in that the pulley head set screws and keyway fell out. It made a similar noise. You might check the pulley and make sure is set correctly on the cutterhead shaft. I had to put in a new keyway and then add setscrews. Now it runs quietly. A bell driven machine should not make that metalic noise. I hope you didn’t buy cheap Chinese bearings.(nevermind. I see you got NTN). That sounds way too loud overall and their shouldn’t be any squealing when it comes to a stop. The nickel test usually refers to motors without a VFD the don’t have a ramp up option. Watched your last video. Something doesn’t sound right. Checking the pulley wouldn’t hurt but I don’t think that’s it. You could also pull the knives and see if the are sharpened evenly. Or try measuring the ends with calipers first and checking for consistency. You might check the pulley and make sure is set correctly on the cutterhead shaft. The pulley seems to seat nicely on the cutterhead shaft. It takes a bit of persuasion with some light tapping with a rubber mallet, and adding the key really tightens things up. Admittedly the key could be a bit cleaner, but I don’t think the issue is related to its fit on the cutterhead shaft. Similarly, after each test run that I’ve executed to-date, I verified that the allen screw that threads into the non-operator side of the cutterhead shaft to help secure the pulley was still tight…no apparent issue there. Interesting point, I never thought about it that way. I currently have my VFD set up to ramp up/down to full/zero speed over 10 seconds. Still, I would think that the nickel test would apply during operation as well as a measure of running vibration, which, in a jointer, I would assume is unwanted at any time during operation. To better illustrate the amount of vibration I’m experiencing, I added a few half-full containers of water to each table; two on the infeed table and two on the outfeed table. This is what it looks like without the belt (i.e. motor only, no spinning of the cutterhead). And this is what it looks like with the belt attached. I pulled the cutterhead assembly apart and inspected the various components. The first thing I noticed was the fit between the operator side bearing and its housing. I can slip the operator side of the cutterhead shaft (with bearing installed) into the operator side bearing housing by hand (no press, no tapping, it slides right in). I’m not overly experienced, but I’m pretty sure it shouldn’t be that way. I took some measurements, and the bearing O.D. is 1.653 in., while the bearing housing I.D. is 1.653 in. Inspecting the bearing outer race and bearing housing interior seating surface, there are no apparent wear marks that indicate the bearing is spinning in the housing. After further inspection, I think the bearings are now shot (can feel a bit of resistance, much more so than I remember when I installed them). So, the current plan is to install new bearings (very carefully), and add a dab or two of retaining compound (Loctite 680) to the operator side bearing to help secure it inside its housing. I’ll have to do this with the non-operator side of the cutterhead fully assembled and semi-installed in the jointer to ensure the mounting holes line up correctly. Considering how easily (relatively) I can slide the operator side of the cutterhead into its bearing housing, applying some retaining compound, sliding it into the housing, slipping the bearing housing into position, and ensuring the operator side mounting holes line up between the bearing housing and jointer shouldn’t be too difficult. I listened to a few other of the same model online and yours honestly sounds about the same. So, I got my new bearings yesterday (SKF 6004-2RSH), and I’ll get them installed sometime this week. Hopefully by the end of this week I’ll have everything installed, back up and running, and all will be right with the world…hopefully.